European Parliament President Martin Schulz has condemned the adoption of a number of laws that curtail the basic freedoms of citizen in Ukraine. "I am deeply worried by the Ukrainian Parliament's adoption of draft laws that could limit the basic freedoms of citizens, impede on freedom of assembly and speech and curtail the activities of NGOs. If they become law, they would push Ukraine back towards its authoritarian, Soviet past. 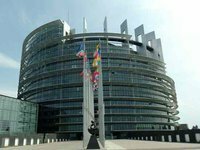 Haste, a lack of transparency and violation of parliamentary procedures are not the way to make sound laws," the European Parliament president said. Schulz urged Ukrainian President Viktor Yanukovych not to sign the laws and ensure that any legal changes are compatible with Ukraine's international commitments. The European Parliament's president confirmed that the door to Ukraine's integration with the European Union remains open. "Yet we need to see a clear commitment from the Ukrainian authorities that they are serious and sincere about Ukraine's European integration. These latest developments not only disrespect the will of people protesting on the Maidan Square, but also could move Ukraine away from its European path and, indeed, away from the civilized world," he said.